I can’t believe these three simple ingredients create such a thick, decadent frosting. It’s vegan, low-fat, gluten-free, refined sugar-free, and so quick + easy. I made this recipe intending to use it on a single-serving cake, so feel free to double or triple the recipe as needed. In a small bowl, mix together cocoa powder and stevia. Add maple syrup. Slowly add water a little bit at a time until you reach the desired consistency. Add extra stevia to taste, if needed. Frost cake, and enjoy! 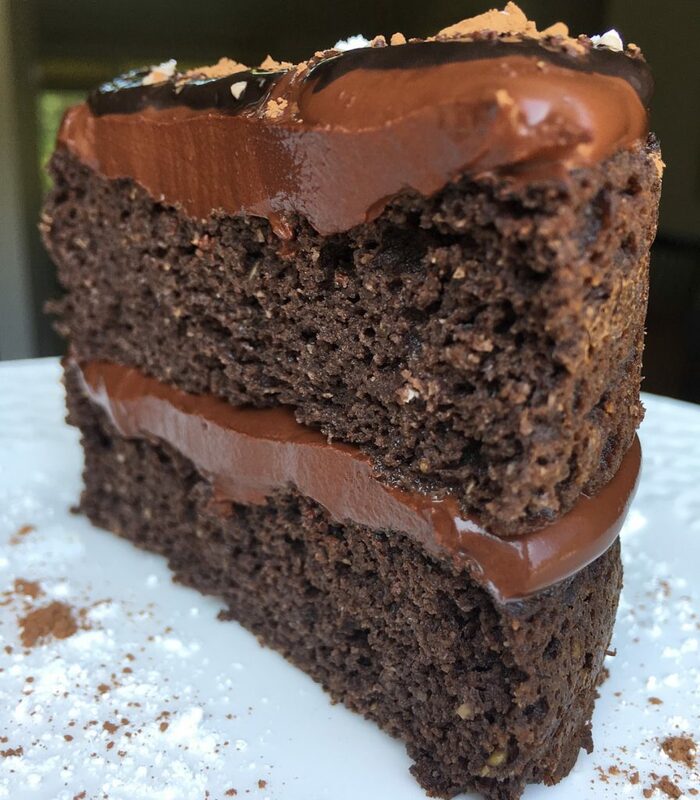 Pictured: Classic Chocolate Cake for One from The Healthy Cake Cookbook frosted with 3-Ingredient Chocolate Fudge Frosting. 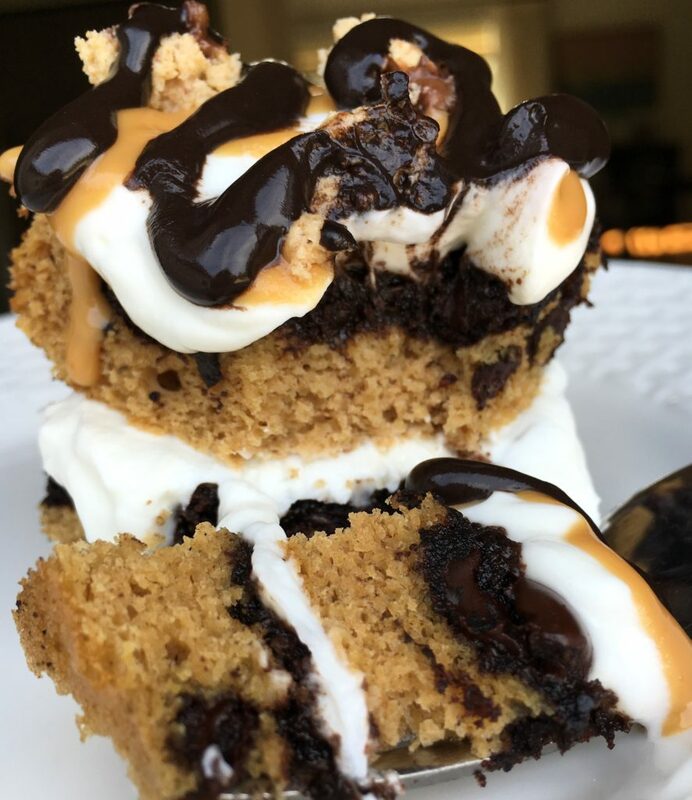 Post a photo on Instagram, tag me @sarahlynnfitness and use #baketobefit if you try this. 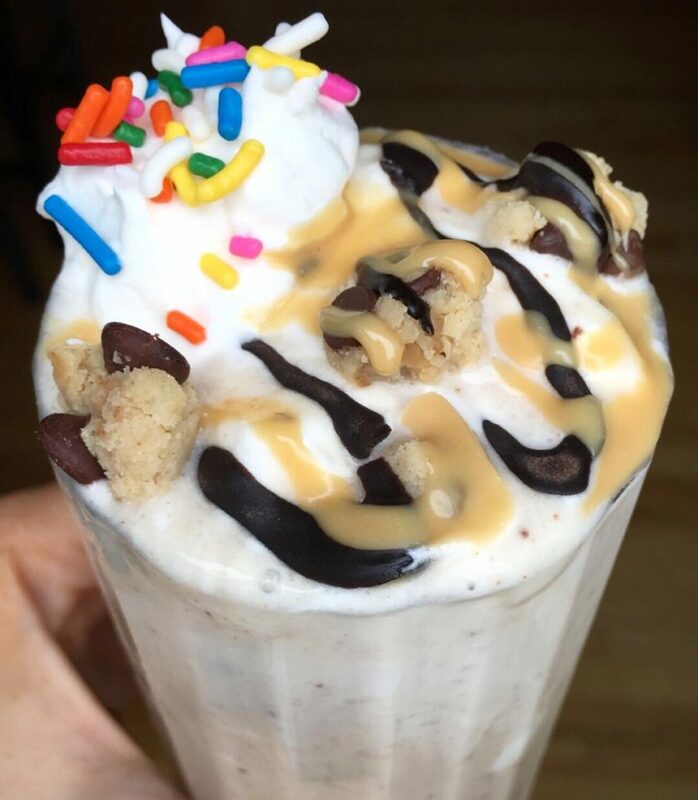 All the flavor of chocolate chip cookie dough wrapped into a creamy, high-protein milkshake. This milkshake is perfect as a quick breakfast option, post-workout fuel, afternoon snack, or a guilt-free dessert. Let’s be honest – there is never a bad time for cookie dough. Pictured: Topped with dark chocolate sauce (cocoa powder, coconut oil, stevia), almond butter drizzle, coconut whipped cream, and chunks of classic chocolate chip cookie dough from The Healthy Cookie Cookbook. Add the first six ingredients to a blender. Blend until combined, but not completely smooth. Add protein powder and L-Glutamine if desired. Blend until smooth. Add chocolate chips and pulse until chocolate chips are well distributed. Pour into a tall glass, add desired toppings, and enjoy! Raspberry bars have always been one of my favorite bakery treats. Unfortunately, most are filled with refined flour and sugar, so they don’t make the healthiest choice for an everyday snack. 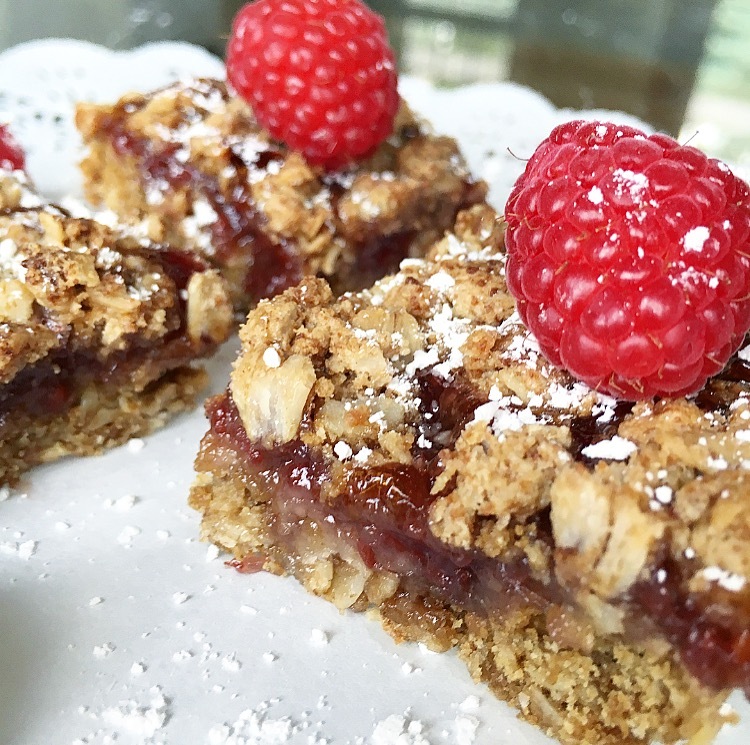 I love making healthier versions of my favorite treats and these raspberry bars are just as delicious as the ones I used to get at the bakery, except they are gluten-free, vegan, and refined sugar-free. Preheat oven to 350 F. Grease an 8×8 square glass pan with non-stick spray, or line with parchment paper. Combine all dry ingredients in a large bowl and stir until combined. Add shortening and cut in with a fork or pastry cutter until a crumbly mixture forms. Add maple syrup and vanilla. Press 3/4 of the dough evenly into the bottom of the pan. Spread with raspberry jam, and crumble remaining dough on top. Bake for 25-30 minutes. Allow to cool before slicing into squares. Enjoy! Post a photo on Instagram, tag me @sarahlynnfitness and use #baketobefit if you try these. YES! Healthy chocolate chip cake topped with a layer of fudgey brownie. This cake contains only healthy, wholesome ingredients. It’s gluten-free, high in protein, refined sugar-free, egg-free, and can easily be made vegan. Pictured: Frosted with whipped vanilla cream frosting and dark chocolate sauce from The Healthy Cake Cookbook, topped with an almond butter drizzle. Preheat oven to 325 F. In two small bowls, combine ingredients for each layer separately. Grease an 8″x4″ loaf pan. Spread the chocolate chip cake layer evenly in the bottom of the pan. Next, spread the brownie batter evenly on top. Top with additional chocolate chips if desired. Bake for about 20 minutes or until slightly firm in the center. I recommend checking on it after 15 minutes to make sure it is not getting overdone, as all ovens cook differently. Allow to cool before slicing into 8 squares. Enjoy! Post a photo on Instagram, tag me @sarahlynnfitness and use #baketobefit if you try it! What if I told you that you could eat this entire batch of cookies for only 260 calories – 8 grams of fat, 37 grams of carbs (8 grams fiber), and 11 grams of protein? Consider this recipe a sneak peak into one of my most popular eBooks, The Healthy Cookie Cookbook. The cookbook contains tons of healthy cookie recipes, so you can always eat the entire batch with zero guilt! 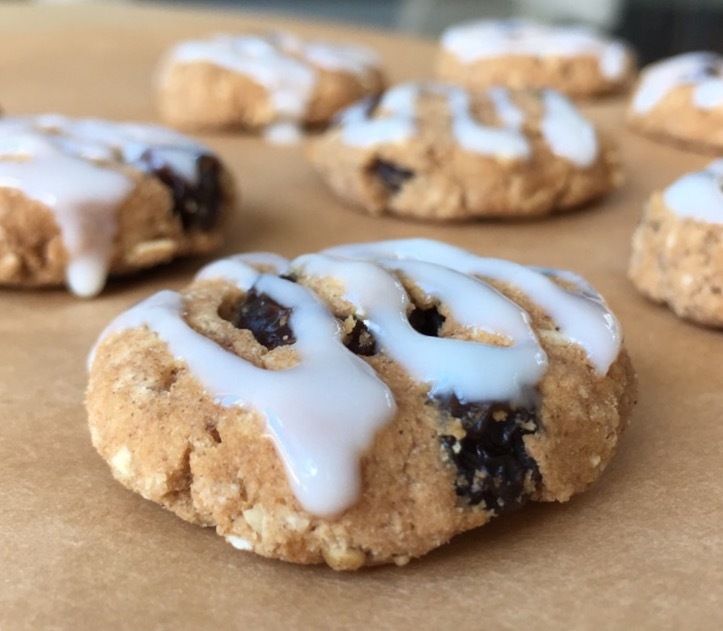 These cookies would make the perfect healthy breakfast, afternoon snack, or guilt-free dessert. Plus, they are gluten-free, refined sugar-free, and vegan-friendly if you use vegan protein powder! Preheat oven to 350 F. Mix dry ingredients in a small bowl (for vegan option: use vegan protein powder or omit). Add all wet ingredients except almond milk and stir to combine. Slowly add almond milk until you reach a thick cookie dough consistency. Add raisins. Form dough into 9 balls and flatten to desired thickness (they do not spread while baking). Bake on a parchment lined or greased baking sheet for 8-10 minutes, or until lightly golden brown on the edges. Allow to cool and drizzle with optional healthy icing (recipe below). Melt coconut butter, and stir in stevia if desired. Drizzle over cooled cookies. Enjoy! 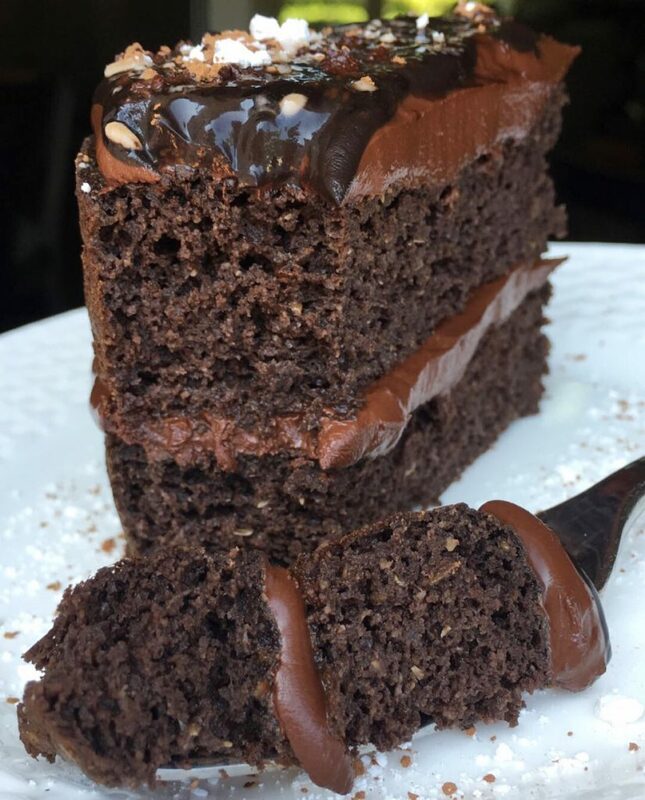 If you make this recipe, share a photo on Instagram and use the hashtag #baketobefit so I can see your post!